Hamas 'founding father' responsible for alliance with Iran in critical condition following 'accidental' self-inflicted gunshot wound. One of the Hamas terrorist organization’s most senior members is in critical condition Tuesday, after he apparently shot himself in the head in an accidental shooting. Fawzy Barhoum, spokesman for the Gaza-based Islamist terror group, said Tuesday afternoon that Imad al-Alami, one of the movement’s most senior officials, was critically wounded when his personal firearm accidentally discharged. Al-Alami, 61, was "inspecting his personal weapon in his home and is in critical condition,” said Barhoum. The Hamas leader was evacuated to a Gaza City hospital. Outlawed by the US in 2003 for his position in Hamas, al-Alami is considered one of the Gaza terror group’s most important assets, due to his extensive ties with the Iranian government – a major sponsor of Hamas – and his personal relationship with Hezbollah chief Hassan Nasrallah, himself a client of the Tehran regime. In recent years, al-Alami operated out of Turkey, where he received medical treatment. 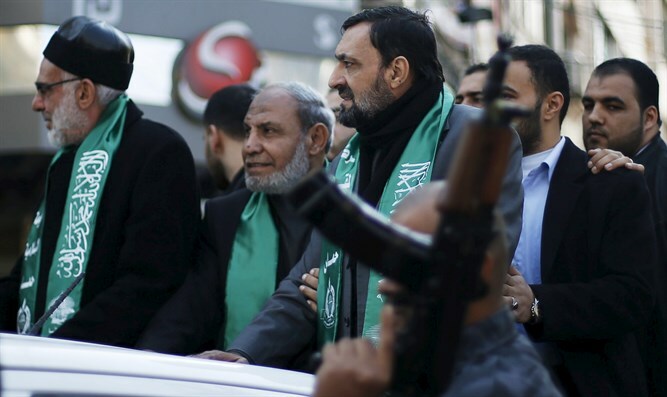 A founding father of the Hamas terror group, al-Alami returned to the Gaza Strip, where he previously served as deputy chief of Hamas’ Political Bureau, and once chaired its “Intifada Committee”. In November, 2016, al-Alami was reportedly selected as Hamas chief Ismail Haniyeh’s designated successor.